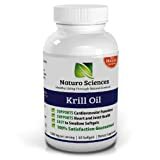 #1 Best Krill Oil 1000mg for Joint Health, Heart Health, Cardiovascular Health, and Mood Support, Comparable to Fish Oil Made By Naturo Sciences Contains 1000mg per Serving of Pure Organic Cold Pressed Neptune Krill Oil (NKO), 30 Servings, 60 Softgel (UPC 720189755590) is sold at the following online stores. We've find the latest prices so you can compare prices and save money when making your purchases online. Please click on the links below to browse to each store's webpage.